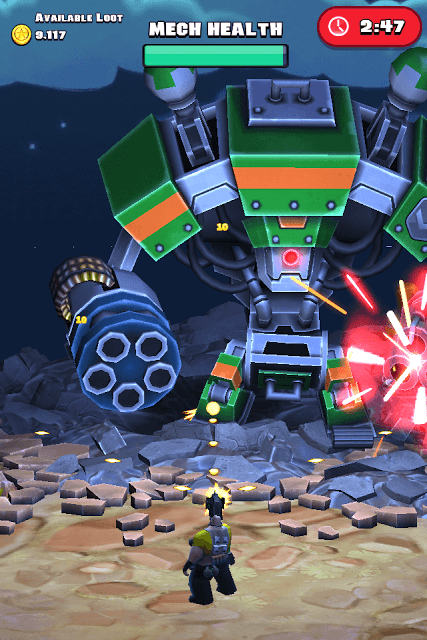 Raid HQ combines mobile strategy with arcade shooter elements and presents a marvelous 3D world full of rugged soldiers, deadly towers and giant robots. Your objective is to select a deploy zone, destroy enemy structures and finally demolish the headquarters to collect loot. You will have to drag a soldier to avoid getting hit by enemy bullets as he keeps firing non-stop at enemies. When your squad reaches the enemy HQ, they will be in for a rude surprise. In this game, enemy HQ transforms into a huge robot firing missiles and slugs, making it tougher for you to destroy it. You don’t have to choose a squad member who has a powerful super weapon. Just select a squad member whose color is stronger than the giant robot’s color. Next, release to enter slow motion mode. Now tap on any super weapon of your choice. Yes you can choose a super weapon of a squad member who’s not in use and that weapon will be deployed to hit the enemy. In a nutshell, you can use a stronger squad member of your choice, and select a super weapon of any squad member of your choice. Enter slow motion mode when you are blinded by bullet waves and homing missiles. Drag to shoot at the enemy and lift your finger up to enter slow motion mode. Yes the background fades, but you would still see the direction of the bullets and rockets reaching your squad member. Now you can drag your squad member to the opposite direction of the bullet or missile wave. In some stages, enemies will deploy mines. Mines explode when a squad member touches them. Mines scattered on the battleground will give your soldier less space to move while enemies will keep attacking him. In such situations, having a soldier with a wider bullet spread can eliminate enemies without moving him too much. To check your soldier’s firing range, go to squad, tap a soldier’s portrait to bring up his card. Now tap the soldier and a new screen will show him in action. This is where you can see his firing range. 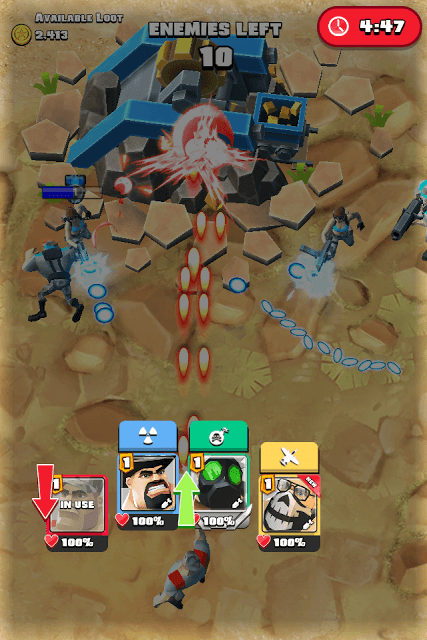 Your soldier can destroy missiles, so if there are any enemy units equipped with rocket launchers, just drag your soldier and face them to destroy their projectiles. Most giant robots will also launch missiles, which can be easily destroyed if you target them. Try to eliminate all enemies that keep appearing in front of an enemy building. Destroying all enemies will automatically destroy the enemy structure. The enemy count at the top of the screen shows the number of enemies a building deploys. You will have to reduce the count to zero to destroy building. When attacking an enemy building, lift your finger up to release and the game will show a green “up” arrow beside a squad member’s portrait. The green up arrow shows that the soldier’s color is stronger than the enemy’s color. Choose a stronger squad member and kill all enemy soldiers to destroy the building. Also, release to enter slow motion mode when there are too many enemy soldiers attacking you. Entering slow motion will give you the idea of the direction of the bullet wave. You can then move your soldier to the opposite direction, forward or backward to avoid getting hit by bullets. Before attacking your opponent’s HQ, tap a landing zone (LZ) that provides more rewards and then press the Attack button. Tap the arrow at the bottom of the screen to check which landing zone will get you more loot. However, an LZ that provides better loot will be harder to beat than others. You can check which color and level an enemy structure of that LZ has on your opponent’s “Pick Your landing Zone” screen. Pinch to zoom in to the map and then tap a structure to find out its level and HP. Tapping the map marker icon will make it easier for you to know an enemy structure’s level and color. It might be difficult for you to destroy higher level structures, so get a strong squad by having more rare or epic soldiers in your team and don’t forget to promote them. Promoting your squad members boosts their HP and DPS. You will need medals to promote your team members. Each medal is color coded and can be used on a squad member of the same color to promote him. So if your squad member is red, he will require red medals to be promoted. There are five color-coded medals – Red, Green, Blue, Yellow and Purple. To get medals, you will need to target enemy buildings of that color. So if you are in desperate need of red medals, then look for red buildings and destroy them to collect medals of that color. Before using medals to promote a squad member, you will first need to ascertain whether the soldier can be promoted or not. To promote a soldier, you must first have the required duplicate cards and only then you can upgrade him/her. You can get duplicate cards via Free Chest that appears every 3 hours. Tap the “Get Cards” section and then tap “Free Chest” to get up to 3 cards. Chances of getting duplicate cards via a free chest are more. Max out resource-producing structures like Gold Mine and don’t forget to upgrade them. Extra structures of the same type will be available for construction once you upgrade your HQ to a certain level. Keep an eye on the Build icon. You will notice a tiny exclamation mark on the icon. This mark indicates that new defenses and structures are available for you to build. Similarly, max out defensive structures so that you can place more such structures on each unlocked landing zone. As you keep upgrading your HQ, you will unlock new landing zones. 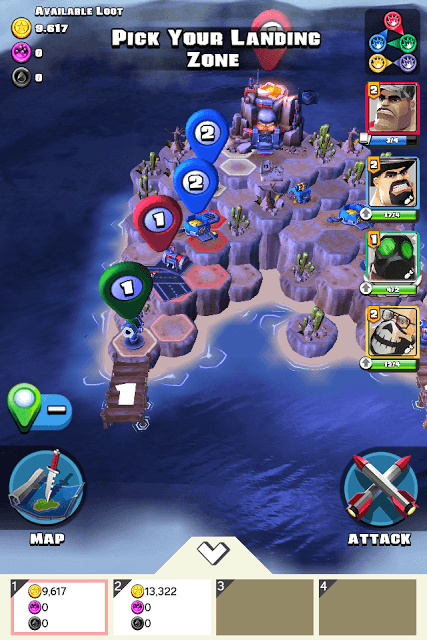 For example: Upgrading HQ to level 3 will unlock Landing Zone 2 (pier marked “2”), whereas landing zone 3 will be unlocked when you upgrade HQ to level 5. With more unlocked LZs, it might be a challenge for you to defend your HQ because your opponent will choose a least dangerous LZ. Hence, having more defensive structures will be of great help as you can place the extra structures on the unlocked landing zone. When you upgrade a resource-producing building, you not only increase its production per hour, but also increase its hit points and capacity. Also each upgrade will get you XP. You should also consider upgrading storage structures from time to time. Your priority should be to upgrade Gold Storage to increase the amount of gold you can store. This is because you will need at least 20000 gold to unlock PvP mode. When you upgrade Gold Storage, the storage cap shown on the top-right corner of the screen will increase. Spend 20K to repair the PVP carrier and then raid other players’ bases. As you keep raiding enemy bases, you will need more gold to strengthen your defenses, build more resource-producing structures and upgrade them. When you unlock PVP mode, you open the doors to other players who can raid your base any time. Build and upgrade defensive structures to make them stronger. When you upgrade your defenses, you increase their HP and DPS (Damage per Second). When you tap an island, you will be taken to a new screen that will show the current stage, squad requirements and loot. To get 10 percent bonus loot, just tap the video icon just above the “Attack” button. You will get extra resources after destroying the enemy HQ. You can decrease the total upgrade time by 10 minutes by watching a video. Tap your HQ to find the video offer. Try this instead of expediting upgrade using gems. Once the timer hits 59 seconds, you can speed up upgrade for free.